Explore hidden gems such as Balloon Rides and Trinity Beach. You'll find plenty of places to visit near Cairns: Kuranda (Opal Time, Birdworld Kuranda, & more), Port Douglas (Agincourt Reef, St Mary’s by The Sea chapel, & more) and Rex Lookout (in Wangetti). Spend the 8th (Wed) among aquatic life with a scuba or snorkeling tour. There's still lots to do: have fun at Muddy's Playground, brush up on your military savvy at The Australian Armour & Artillery Museum, view the masterpieces at Bones and Jones, and appreciate the history behind Cairns Cenotaph. London, UK to Cairns is an approximately 23.5-hour flight. You'll lose 10 hours traveling from London to Cairns due to the time zone difference. Expect a bit warmer weather when traveling from London in May: highs in Cairns hover around 32°C, while lows dip to 24°C. Finish your sightseeing early on the 12th (Sun) so you can travel to Sydney. Step off the beaten path and head to Kiama Blowhole and Room Escape Games. Explore the numerous day-trip ideas around Sydney: Govetts Leap (in Blackheath), Shelly Beach (in Manly) and Katoomba (Wentworth Falls, The Three Sisters, & more). Dedicate the 21st (Tue) to wine at some of the top wineries in the area. 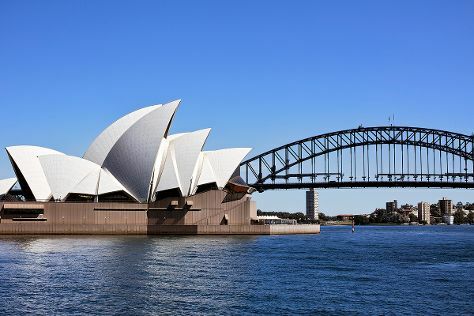 The adventure continues: see a show at Sydney Opera House, get to know the fascinating history of The Rocks, snap pictures at Sydney Harbour Bridge, and take in the spiritual surroundings of Nan Tien Temple. To see maps, reviews, other places to visit, and other tourist information, read our Sydney travel route planner . Traveling by flight from Cairns to Sydney takes 6 hours. Alternatively, you can drive; or take a train. Plan for slightly colder temperatures traveling from Cairns in May, with highs in Sydney at 24°C and lows at 14°C. Wrap up your sightseeing on the 23rd (Thu) early enough to travel back home.